We moved in January, and it was COLD! It took a couple months before Spring broke through and I was able to get outside. The first time I saw this house, I knew I needed to repaint the garage doors. Kind of an odd thing, but it's true. 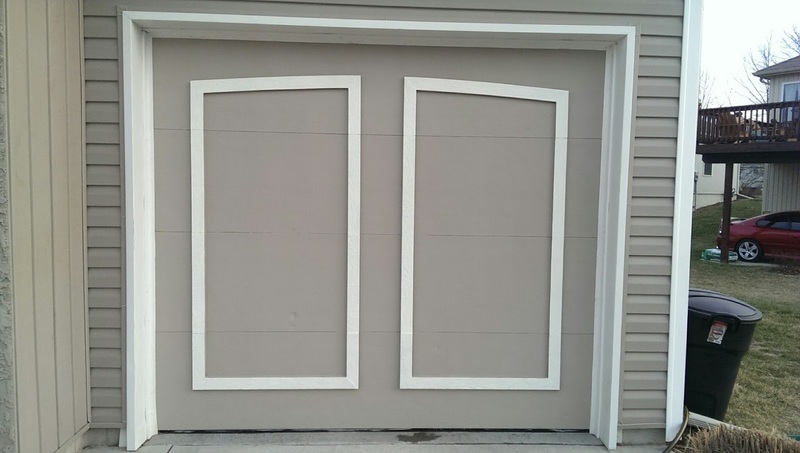 All the houses around ours had their accent pieces on the garage doors painted white. I really like the look of that. I repainted the whole door because new paint makes everything look fresher. 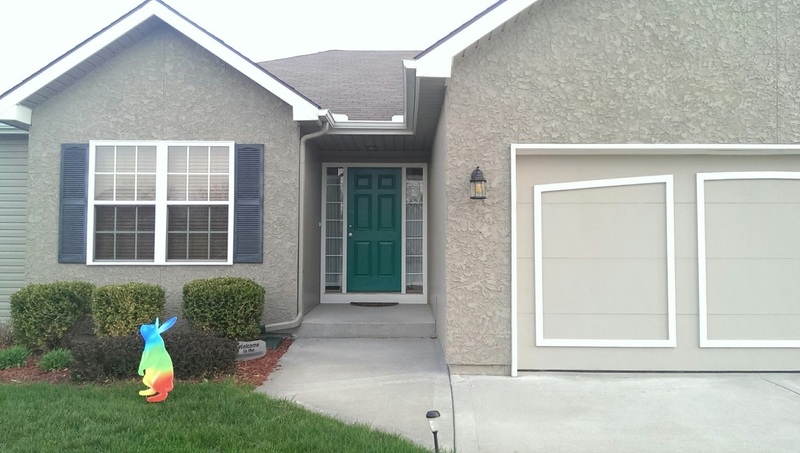 It took a while because we have a three car garage, but it really increased our curb appeal! I was in a painting mood after that and got some metallic black spray paint for the outside lights. They used to be silver, and the clear coating on then was flaking off and looked terrible. They look super classy now! Next, I repainted the front door! (I told you I was in a painting mood.) It used to be black or dark dark green maybe. I painted it while it was on its hinges still and was careful to watch for drips. I got a mini foam roller from Harbor Freight for this. 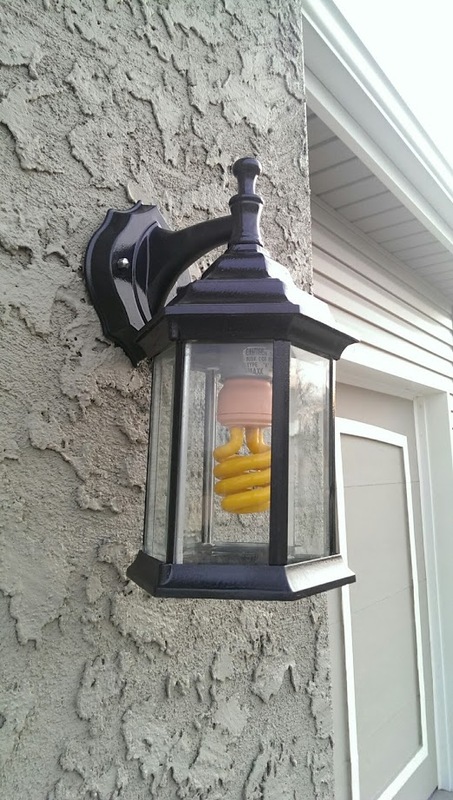 It took three thin coats of paint, but the result was definitely striking! Our front door is Bright green with a capital "B". It's actually called "Mermaid Sea", I think. It was a bold choice. I almost chickened out, but I'm glad I didn't. A bright front door is eye catching and recommended on every single article I've ever read about increasing your curb appeal. 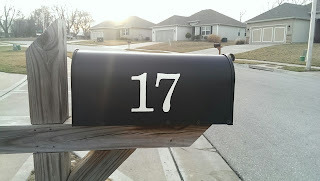 Finally, I finished my outdoor painting spree by painting our house number on the mailbox. I did this by printing off the numbers, cutting them out, and sketching an outline to paint. This really felt like the icing on the cake, my friend! This photo I took afterwards with the sun on the horizon really felt to me like "Welcome Home".